Cabrera Capital Markets provides cost containment programs and ideal solutions for both pension fund managers and municipal agencies. Our Commission Recapture Program and Directed Brokerage Programs convert existing liabilities into ongoing assets, both improving a fund's cash flow and reducing its expenses. Our trading desk maintains flexibility by offering a broad array of execution alternatives for investment managers. 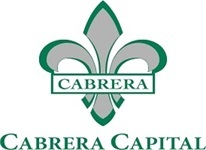 Cabrera has entered into trading arrangements with several of the nation's largest brokerage firms to provide such services. These arrangements give our clients the advantage of placing trades directly with their regular traders at their respective firms.